2. Start your apple strudel by setting the oven at 200 degrees C.
3. Make the apple filling. Place a pan on a medium heat. When hot, add the butter, let it melt and then add the apples. The apples will need to be cooked through, which will take about 7-10 minutes in total. Stir them occasionally. After a few minutes, add the sugar and mix again. Let it cool for about a minute more and then add the raisins, almonds, and cinnamon and mix. 4. Add the ingredients to the filling. Now combine the lemon juice, lemon zest, and cornflour in a little bowl and add them to the apple filling. Stir it thoroughly and let it thicken. Then, remove the filling from the heat and place it on a metal tray to cool. 5. Mix the bread crumbs, cinnamon and sugar. Into a bowl, combine the breadcrumbs, the sugar, and the cinnamon. Mix well and set aside. We are now ready to begin the pastry. 6. Make the phylo pastry. 7. When working with phylo pastry, be sure to keep it underneath a damp towel. Otherwise, the pastry will dry out and become unmanageable. Place a sheet of phylo on your work space and brush it generously with the melted butter. Now take the cinnamon mixture and sprinkle some of it over the entire surface. Next lay another layer on top of the first sheet, brush it with some butter and then turn it over. Butter the second side and sprinkle it with the cinnamon mixture. Repeat this action with a third sheet. For the fourth sheet of pastry, butter both sides of the pastry but do not add the cinnamon mixture. Now flip all 4 sheets of phylo so that the first sheet is in top. 8. Fill the phylo and roll it into a log. We are now ready fill the phylo. Make a line with the mixture along the long edge of the pastry. Now carefully roll it into a log. Place a piece of waxed paper on a baking tray and place the strudel on top of the paper. Press each end a little and place it in the oven. Let it cook for about 20 minutes. 10. Remove from the oven and serve. Then you can take your apple strudel out of the oven. Place it on a cutting board and sprinkle it with a bit of powdered sugar. Cut into slices and enjoy. 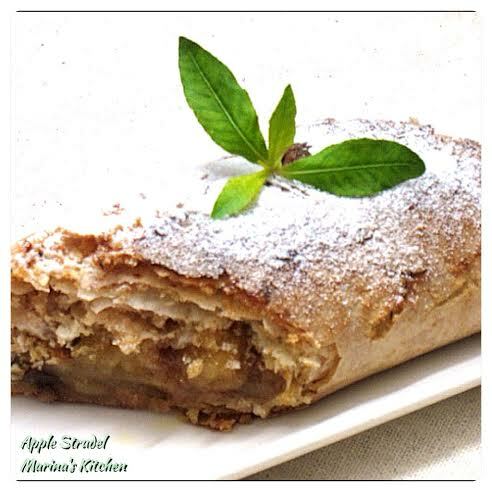 Apple strudel is best serve hot, with a little vanilla ice cream.